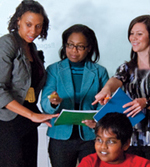 Learn About Lesson Study - Teacher PD "With New Eyes"
Ontario Certified Teachers: Who are they? It started in Japan and it's rapidly gaining popularity with Ontario teachers. Lesson Study is a new form of professional learning in which a group of teachers work together to perfect the teaching of one lesson, focusing on a key concept that students of all abilities need to learn. Teachers and schools that use Lesson Study are finding immediate benefits in terms of student understanding - and even greater long-term benefits as teachers apply what they learn about their own teaching to their whole practice. Learn about Lesson Study in the March issue of the College of Teachers magazine Professionally Speaking. The tight job market for certified teachers is continuing its downward spiral. The College's just-released the 2009 Transition to Teaching survey of new Ontario Certified Teachers say they cannot find work or enough of it. However, many say they are prepared to wait months or years to secure full-time employment. The trend, now in its fourth year, shows an extremely crowded job market for English-language teachers. And French-language teachers no longer have a direct route or definite advantage getting into classrooms. But it's New Canadians who struggle most to find work, followed by those educated at New York state border colleges. At the same time, the interest in becoming a teacher is waning. The Ontario University Application Centre reports a drop in teacher education applicants to 12,000 in 2009 from 16,000 three years ago. The College's award-winning, well-designed and informative magazine is not just for teachers – it's packed with lots of great information for anyone looking for educational resources. Take a look at the latest issue of the magazine for instance. In addition to Lesson Study and our Transition to Teaching survey, you'll find something for the devoted logophile. Canada's Word Lady Katherine Barber delves into the sometimes wacky origins of Canadian English in the Colourful Story of English. NetWatch offers web site reviews featuring some of the best online resources for students, teachers and parents. The most recent column covers child nutritional issues, while past topics have included science and literacy sites. An extensive archives brings good sites to your fingertips. Looking for teacher-approved books for children? Our book review section covers approximately 12 to 13 publications per issue. You'll find reviews of the latest children's novels, books on learning theory, literacy, maths and sciences, child psychology and much, much more. Each issue also showcases some of the best teachers in the province through our Exemplary Teacher section. See teachers who are making a difference in our schools today like Muriel Sawyer, recipient of a 2009 Prime Minister’s Award for Teaching Excellence for her 35-year career teaching the Ojibwe language to Anishinaabe and non-native children. Every issue of Professionally Speaking offers lots of great information for anyone interested in education in Ontario. It is published four times per year and fully indexed back issues are available on the web site. Where in the world do College members come from? How are they qualified? What are the most popular College-accredited courses our members take for their professional development? How did the College deal with complaints against members of the teaching profession? All of the answers and more can be found on the College web site. While you're checking out the statistics, why not take a few minutes to review the Public section of our site, where you can learn about how the College works in the public interest, including how the College promotes teacher professionalism, encourages standards in education and accredits teacher education programs.